Tributes paid to former Labour leader Michael Foot, who has died aged 96, have focused on his passion for politics, books and life. However the statesman had another great passion for almost his entire life - the city of Plymouth and in particular Plymouth Argyle Football Club. 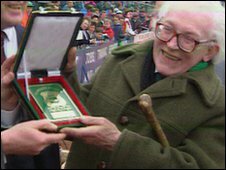 Born in the Devon city on 23 July 1913, he became a loyal Argyle supporter as an eight-year-old boy when his father Isaac began taking him and his brother to watch his Home Park heroes. Mr Foot was such a great fan of the Pilgrims that he was signed to the club as an honorary player in 2003 to mark his 90th birthday. Argyle chairman Paul Stapleton said Mr Foot's death was very sad. "He was a passionate supporter of Plymouth Argyle and I feel very sad because we always promised Michael that we'd get him to the Premiership before he passed away," he said. "We went up two leagues, but we just couldn't manage the next one. "I remember his 90th birthday when he was registered for the season with a shirt number 90 - although he didn't play actually." Two years earlier, in 2001, Mr Foot was part of a group of Argyle fans who took over the club from then chairman Dan McCauley. As one of the "new boys on the block", Mr Stapleton said he looked to Mr Foot as "the old and wise head". "He was an integral part of those early years," Mr Stapleton added. Mr Foot's niece, Sarah Burbury, of Saltash, Cornwall, said: "After his wife died he used to come down whenever there was an Argyle match. "He loved being in this part of the world. "Plymouth was his great love because he had been MP there and he was so attached to the dockyard, but also partly because of Argyle." She said Mr Foot was "the most wonderful uncle". "He was always wanting to play games, although he had bad asthma. "You would never have known because he always wanted to join in everything." In 1945, 10 years after Mr Foot joined the Labour Party, he became MP for Plymouth Devonport, the first time Labour had ever held the seat. Following the devastation wrought on the city by German bombers during World War Two, Mr Foot was heavily involved in the recovery of his beloved city. Lord Owen, himself a former Plymouth Devonport MP, said: "He was a great West Country man and he had a major role in the rebuilding of the city after the war and the city will always remember him. "I remember him at the age of 11 speaking in Devonport with Aneurin Bevan on the platform when I went with my grandfather and my father, so I've known him man and boy. "And I want to pay tribute to him in a way that Plymothians feel. "He was a Labour MP with two others in 1945 and they made a massive contribution to helping to rebuild the city after the devastation of the bombing."